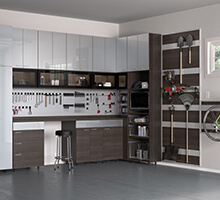 With more than 33 years of experience creating custom closets and home storage solutions for coastal California, the team at California Closets San Luis Obispo is expert in designing innovative and organized spaces. From San Simeon in the north to Santa Maria in the south, the team will work directly with you to develop a system that meets your desired functions, aesthetic and budget. Throughout the years, this team has designed everything from personalized garage organization to accommodate outdoor gear, to home offices that also need a wall bed to accommodate guests. Whether you’re downsizing or just need to make the most of the space you have, California Closets San Luis Obispo will make your home come to life. While there is not currently a showroom in this area, the design consultants of California Closets San Luis Obispo are more than happy to come to you. Schedule a complimentary in-home design consultation when you are ready to explore custom ideas for your space. Easy from start to finish. The designer gave us exactly what we needed. The installation was on time and done well. We are 100% happy. Great designer offered lots of ideas we hadn’t thought of. The installers were fast clean and polite. We love the final product; it’s so useful and gives us much more space. Our installer is worth waiting for. What attention to detail and what confidence that the job will be perfect! Our designer has answered every question in a timely and thorough manner. What is not to like here? Love the expertise of employees. Love the kindness and incredible work ethics of both people that I worked with. You have truly very professional and hardworking talented people with these too. Thank you so much for doing such a wonderful job and making this client extremely happy. The design consultant did a great job. The two young men who installed the closet were very professional and friendly. The experience and the closet is exactly what I had hoped for. Thank you very much. Quality people that know the business from design to installation. This is the second home we’ve used California Closets. Excellent! 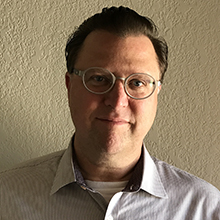 I appreciate the experience that your design consultants bring to the table – and the technology that they use so that we can “see” various options and possibly modify them before we do the work. Our consultant was excellent! She was highly conscientious technically skilled communicative and oriented to meeting our real needs (and not overselling the product). I love the quality of the product and all the representatives we dealt with were amazing! Every employee is extremely professional in their approach to their participation in creating products that totally match the expectations of their customers. They are responsive to the needs and desires of the customer. Their products are of the highest quality. We are completely pleased with all of the personnel and products. My designer was excellent and worked around my schedule. The team that installed were professional punctual and left the work area clean as a whistle. Our closet looks fabulous – thank you! Great! Incredible planning and attention to detail led to fantastic (and expected) results! My designer was great. She was always in contact with me. She designed my closet to fit my needs and concerns. The installer was great. He did a great job. I would recommend California Closets to my friends or anyone who is thinking about organizing their closet. 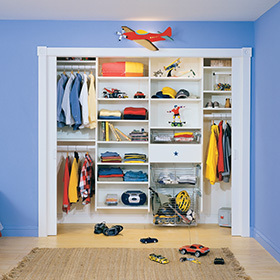 California Closets San Luis Obispo offers quick and easy financing to help make getting organized easier. Our talented designers can take any room and make it the most beautiful, organized room possible for you. 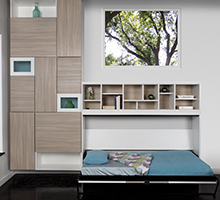 When it comes to closets, you can make any space beautiful and functional. Let our design experts help!